Growing up, I absolutely loved jumping on our trampoline in the backyard. I would spend countless hours out there practicing my gymnastics and playing with friends. As I got older, I even used it for sleepovers outside and, of course, for tanning! This was before we had to worry about sunspots and wrinkles! 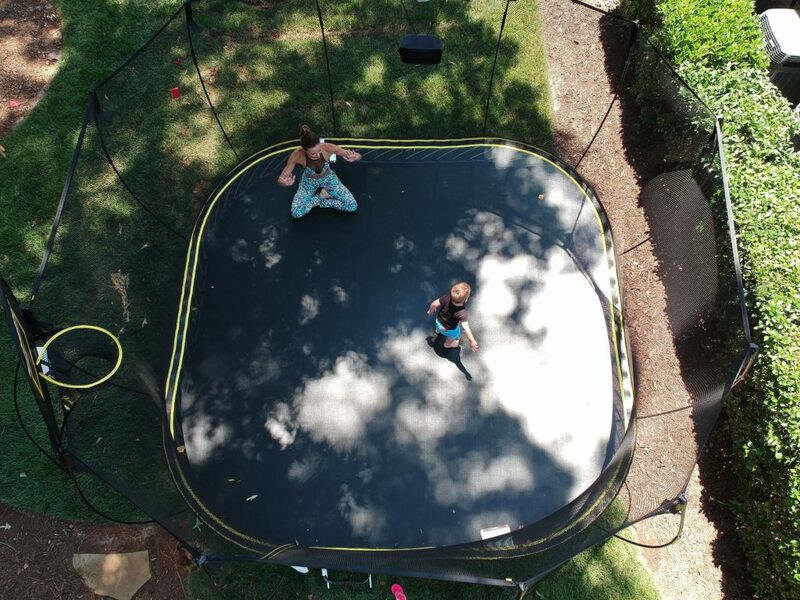 A lot of my childhood memories were spent on my trampoline, and now that I am older, I had still been wanting a trampoline again! It burns a ton of calories, plus it’s a fun workout that’s easier on your joints. However, my husband, who drives 200 miles an hour next to 39 other cars every weekend, said it was “too dangerous”. He said I could fall through the springs or go flying off the sides so it was out of the question for me, and now Brexton, to have one. Like with everything else we did as kids, nowadays it’s “too dangerous”. 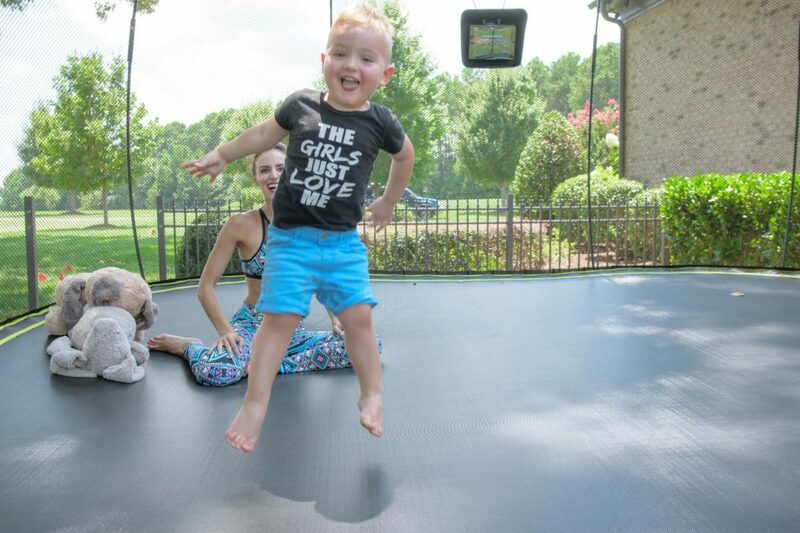 But, lucky for us, Springfree Trampoline has gone above and beyond to add safety measures to the classic trampoline, so much so that Kyle even agreed we could get one! First, there’s no more springs! Instead, they replace them with flexible composite rods that still gives you a great bounce. Also, the springs are not on the side anymore, they are below – so there’s absolutely no way to get a limb caught between them like we used to when we were little. Nets around the trampoline have been around for a while, however, a lot of them could not support much weight. Springfree Trampoline’s FlexiNet is so strong that up to 400 pounds can jump into the side of it without anything happening. The FlexiNet is made from a special fabric that doesn’t tear and can withstand the harshest UV rays so it will last a long time. And the rods are made from a special recipe formulation that is three times stronger than steel! As you can see pictured, I have all my body weight laying against it and it doesn’t budge. Kyle also did the same, with the same results. Like everything else these days, this trampoline is even a smart trampoline! 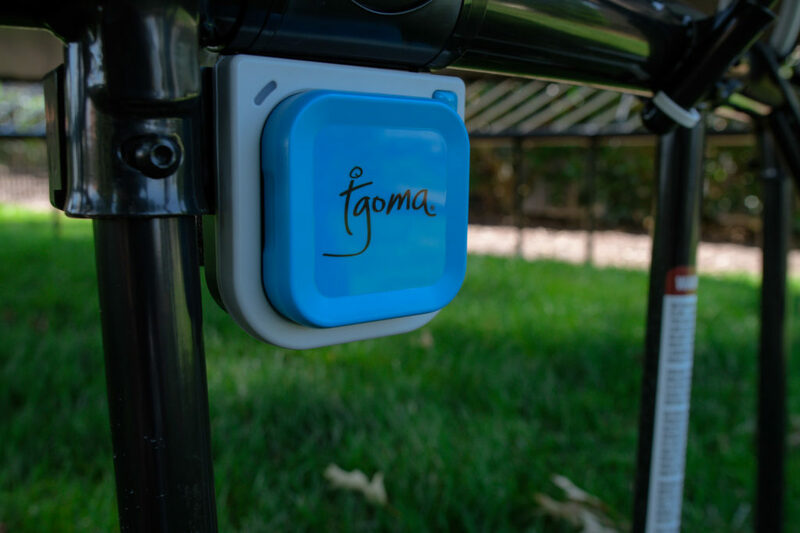 The tgoma system has four sensors on the trampoline mat that connect to the Bluetooth on your iPad (or tablet). The special app lets you do all sorts of games and workouts! The kid games are awesome, Brexton’s favorite is popping the aliens. He can look at the screen and jump to corresponding parts on the trampoline and pop them. It’s great because the games motivate kids to jump more and play longer outside – which this mommy loves! What I especially like about this is that Springfree Trampoline is an advocate for one child jumping at a time to prevent injury. Especially for the older kids, these games give the other kids something fun to watch as they take turns and they can play against each other for points. Of course, there are even “games” for Mommy! With a variety of workouts within the app I’m able to burn a ton of calories while having fun and getting a new workout in. Did you know that 10 minutes of jumping on a trampoline is equivalent to 30 minutes of jogging? I find it way more entertaining than jogging! Other fun things we have done with our trampoline is taken sidewalk chalk to draw shapes onto the mat for Brexton to jump onto to help him learn his shapes and colors as well. It’s super simple and washes off with one rain. 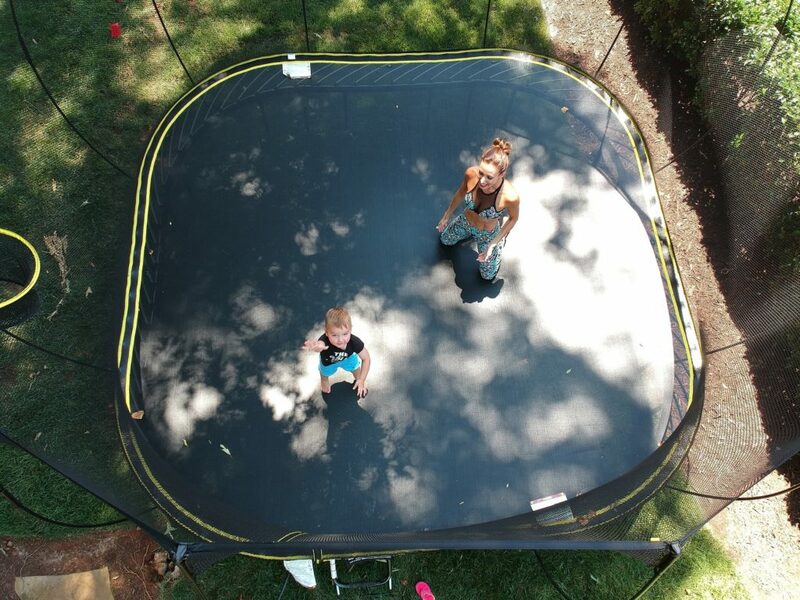 I applaud Springfree Trampoline for adding so many safety measures into their product. We have all enjoyed it and it’s a great way to get outside and get moving!